Growing up, I was very sheltered culinarily. My parents didn't know, or care, too much about food. Dining was more of a necessity than a pursuit, and as a result, my childhood was filled with countless meals at McDonald's, or Taco Bell, or, if we decided to "splurge," Hometown Buffet. That all changed, however, when I arrived as an undergrad at Berkeley. Freed from the "corporate" nature of the OC dining scene, I was exposed to what I'd been missing all those years. Indian, Thai, Korean, Vietnamese, sushi, something as simple as a well-prepared steak--they were virtually unbeknownst to me prior to my four years at Cal. I embraced, reveled in this newfound gastronomic freedom, and among the many gustatory revelations that I incurred was Chez Panisse. This birthplace of California cuisine was, after all, my first real fine dining experience; it was something that I saved up for; it was, in a sense, a precursor to everything else that followed. We cannot, of course, talk about Chez Panisse without mentioning its founder, its chef matron, its matriarch: Alice Waters. Born April 28, 1944 in the small town of Chatham, New Jersey, Waters moved to California to attend UC Berkeley, completing her BA in French Cultural Studies in 1967. During her studies, she traveled extensively throughout France, and came back positively enamored with the cuisine--not the grandiosity of the Michelin stars in Paris, but rather by the rustic, modest bistros and brasseries dotting the French countryside. After returning to the States, Waters worked a stint as a waitress before teaming with Pastry Chef Lindsey Shere and comparative literature lecturer-turned-film producer Paul Aratow to open Chez Panisse in 1971. The restaurant, named after a character from a Marcel Pagnol film trilogy, was, from the start, designed to honor the bounty of fresh, seasonal, sustainable, locally-sourced produce, prepared on the spot, and often sprinkled with improvisation. Interestingly enough though, it was Aratow, not Waters, who served as the original Chef de Cuisine, as he had an extensive knowledge of French cookery owing to his mastery of the legendary food "bible" La Bonne Cuisine de Madame E. Saint-Ange (which he eventually translated to English). Aratow, however, had bigger dreams, dreams of Hollywood, and sold his share of the restaurant when he moved to Tinseltown. Helping to fill the void left by Aratow was Jeremiah Tower, who took over in the kitchen and eventually became a principal owner of the restaurant, as well as a notable chef in his own right. Tower only stayed on board for several years, but the restaurant continued to blossom under the leadership of Waters and a long line of chefs. Today, Chez Panisse's kitchen is helmed by Jean-Pierre Moullé (who first started in 1975) from November to May, and by David Tanis (working on and off since 1983) from May to November. In addition to the formal Restaurant, we also have the upstairs Café, which opened on April Fool's Day, 1980. Meant to serve as a more casual alternative to the prix fix Restaurant, the Café and its legendary pizzetas even formed the basis for Wolfgang Puck's seminal restaurant, Spago (which, apparently, was originally slated to be a pizzeria; Spago then led to the birth of CPK). Following the debut of the Café, Waters founded Café Fanny, also in Berkeley, in 1984. Named after her daughter, as well as yet another Marcel Pagnol character, Fanny is a very informal cafe serving breakfast and lunch only. Inside, you'll find the smallish dining room swathed in loads of wood and only a bit less copper, evocative of a polished yet refined Craftsman-inspired aesthetic. The seemingly simple downstairs menu changes daily, and gradually increases in complexity, and price, as the week progresses. 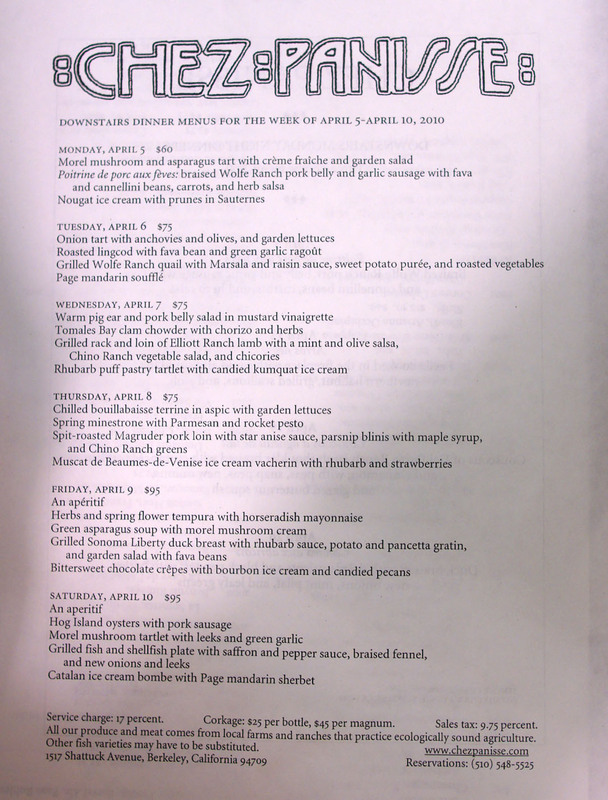 We went with the four-course Friday menu, at $95 per person. 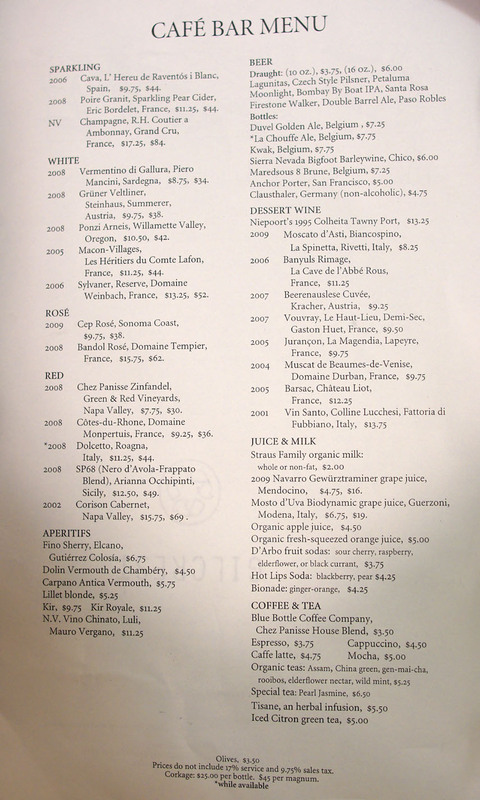 I've also posted the Café and Café Bar menus for reference. Click for larger versions. 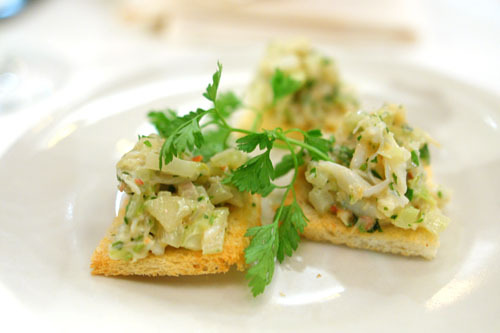 We began with lovely little bites of crab and lobster, in a mélange of shallot, mayo, and lemon. I appreciated how the intrinsic sweetness of the crustaceans was emphasized in the commixture, and how their briny nature was apparent on the close--a great hors d'œuvre. To go along with the amuse, we were provided "an apéritif." On this evening, it was a fantastic vin d'orange, basically an orange-infused liquor. Light and subtly sweet with the tang of citrus, it was a perfect summer libation. One of my dining companions was running late, so while we were waiting for him to arrive, some beers were in order. 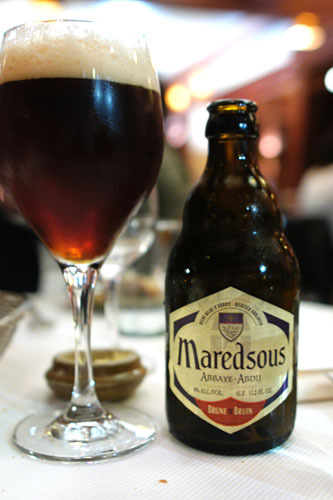 First was the Maredsous 8 Brune [$7.25], a chocolate-y, roast coffee-tinged, malty, viscous liquid prototypical of a Trappist Dubbel. 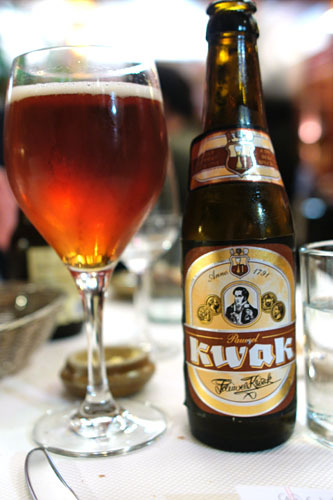 We also had the Pauwel Kwak from Brouwerij Bosteels [$7.75]; done in my preferred Belgian pale ale style, the brew demonstrated a fantastically indescribable flavor, with complex hoppy and fruity notes accented by undertones of spice. 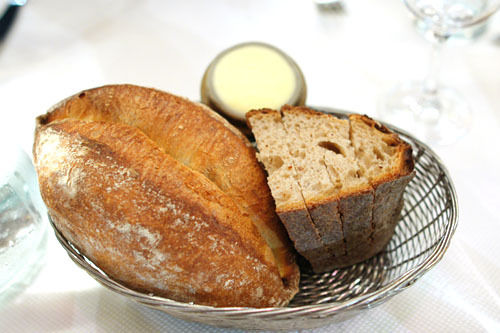 Bread comes courtesy of nearby Acme Bread Company, which was founded by Chez Panisse alum Steve Sullivan. Tonight's selections were a whole wheat sourdough and a French roll. 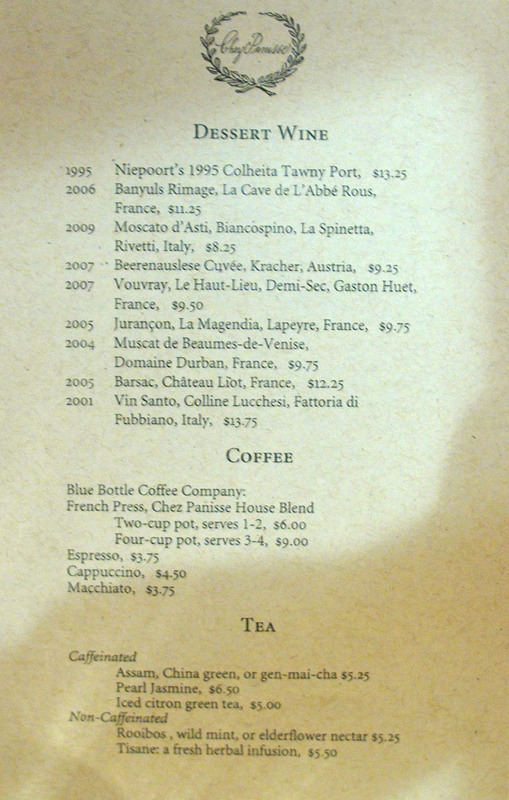 At this point, we ordered a bottle of the NV Crémant du Jura, Stéphane Tissot [$54]. 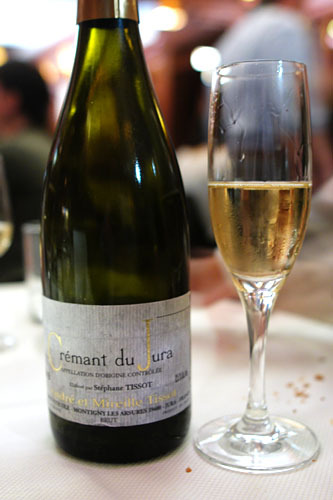 Minerally, citrusy, and surprisingly complex, it went beautifully with the food to follow. Our meal proper began with some simply battered and fried vegetables. 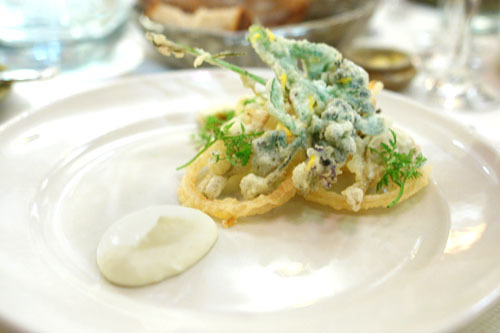 You could almost think of these as high-class onion rings, though the use of artichoke did add a little more complexity into the mix. Good enough, especially with the tangy horseradish, but I would've liked the dish better if the unique characteristics of each vegetable were better highlighted. I'm somewhat of an asparagus fiend these days, so it should come as no surprise that this was my favorite course of the meal. 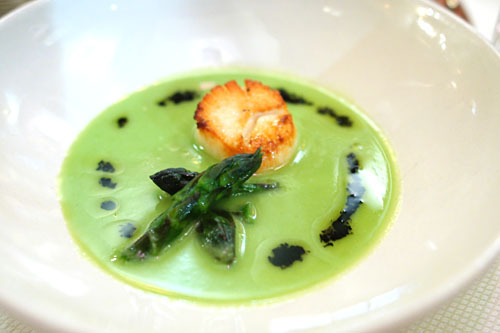 The soup was astoundingly profound in how it so sharply conveyed the quintessence of asparagus--its cool, crisp, light, bright, gently astringent savor instantly perked up my taste buds. I would've been happy with just the potage alone, but the perfectly cooked scallop, with its pleasingly rare texture and delectably caramelized top, was icing on the cake. Next, our main course consisted of some of the best duck I've had in a while. Cooked to a perfect doneness, the bird was tremendously flavorful and beautifully textured. Meanwhile, the gratin presented a great interplay of salty pancetta and mild potato, while the green, vegetal tang of the salad helped in offsetting the dish's gravity. Very nice--my only quibble was that the rhubarb sauce was a touch sweet. Dessert was upon us, as was this selection of after dinner drinks. I ended up going with espresso [$3.75] from Blue Bottle Coffee Company, an interesting choice for me given that I'm not normally a coffee drinker. Click for a larger version. The crêpes themselves were delightfully sugary, but not overwhelmingly so--uncomplicated in their appeal. Clearly however, the pièce de résistance here was the bourbon ice cream. 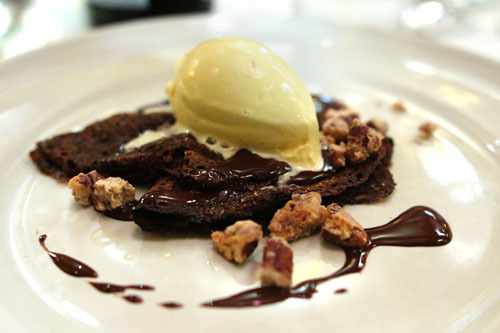 Its woody, toffee-tinged flavors formed a wonderful amalgam with the chocolate, while the pecans provided just a bit of nuttiness as well as some textural play. 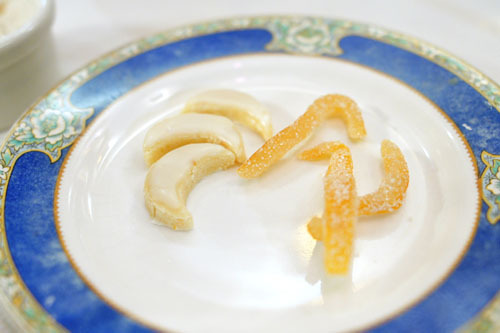 Mignardises consisted of candied citrus peel and some crescent moon-shaped, Pop Tart-esque cookies with a distinct almond flavor. 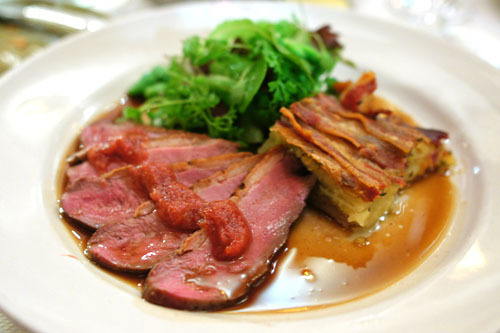 It's often been said that the cuisine at Chez Panisse is a touch on the staid side. It's a bit rustic; it's a bit homey; it doesn't "wow" you. Indeed, the place may lack the hyper modernity of Alinea, or the sheer opulence of Robuchon, or the utter transcendence of Urasawa, but, at the same time, it doesn't strive to be any of those places. For what it is, I can only conclude that the restaurant is successful. 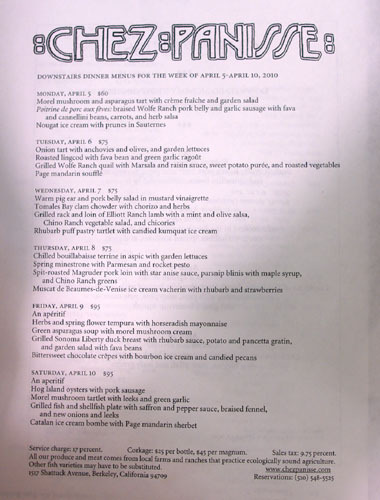 Perhaps we need to take a look at Chez Panisse not as merely a dining establishment, but as an ideal, a paradigm, something that goes beyond just the food, beyond even the chef--after all, does anyone really care who's cooking at Chez Panisse? It's not Alice; that's for sure. But maybe we should care. Mark Peel (La Brea Bakery, Campanile, Tar Pit), Paul Bertolli (Oliveto), Suzanne Goin (Lucques, A.O.C., Tavern), Judy Rodgers and Gilbert Pilgram (Zuni Cafe), Michael Tusk (Quince), April Bloomfield (Spotted Pig)--these are just some of Chez Panisse's most notable alumni, chefs that are marking their own marks on the American culinary landscape. The foodist world is a fickle one. Restaurants come and go, rise and fade, ebb and flow. But after nearly four decades on the scene, a reservation at Chez Panisse is still one of the hardest to score this side of French Laundry. They must be doing something right, right? "Sheltered" childhood? I'd call that deprived. Sheltered implies your parents were protecting you from the scary gastronomic world out there. You make a good point about how Chez Panisse stands more for an idea, a pinpoint of culinary revolution, than a fine dining restaurant. Still, if that's the case, $95 is rather steep to pay for access to that paragon. April Bloomfield - not Bloodfield...although that would make a good title for the next Saw sequel. I actually had a reservation here a few weeks ago, but canceled last minute and opted to try Fifth Floor instead. Heard through the grapevine that CP can be a little mundane for $95. No regrets! Fifth Floor, although not perfect, had some fun dishes. Its a good thing you ate at Cheeseboard beforehand... knowing you, this wouldn't be nearly enough food to get you full! I've eaten at the Cafe four times or so... and I hate to say it, but I've never had a truly enjoyable meal there. That said, I'd still be interested in eating at the restaurant just to cross it off of my list. And I think you hit on a couple of key points -- the legacy of this restaurant is two-fold: 1) that today we take for granted their market-to-table ideology because its so common place (I mean whoa, Chez Panisse invented the baked goat cheese salad and introduced arugula to the culinary world! )and 2) the roster of alumni that have passed through those vaunted doors have had such a profound impact on the culinary landscape in their own rights. As a 4th year here at Cal, I have been your reader for the past one year and a half. This is one of the most inspiring article that I have read so far. Thank you! During my four-year life here at Berkeley, it really changes my point of view about food choices and get to experience different cuisines available here at Berkeley. I think I am going to continue to carry these values with me wherever I go. Again, thanks for your writing! 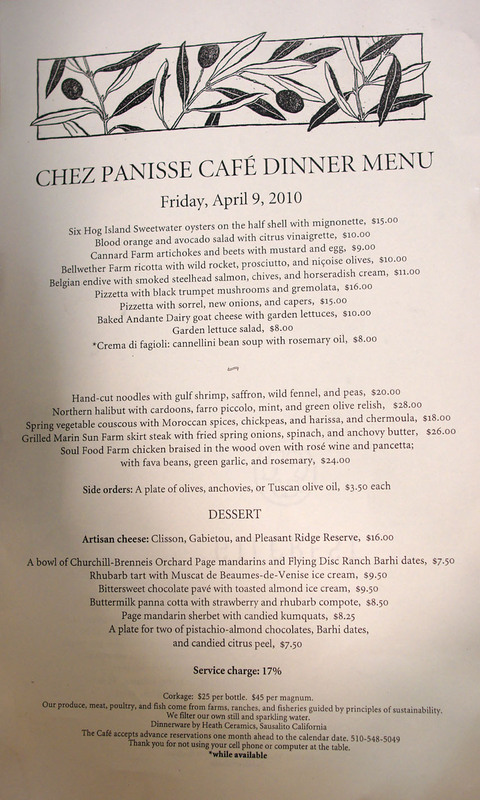 I had a pretty good meal at Chez Panisse Cafe back when I was in college. I agree that while the food isn't revolutionary these days, it's still done well. Aaron: Deprived works too. I think that it was pretty much a result of them not knowing any better, and not wanting to know any better. Danny: Why can't it be both? ;) We actually wanted to add courses from the cafe upstairs, but their kitchen was already closed. Where did you end up going in NorCal? Anon: Saw sequel indeed lol. I'll go ahead and make the correction. Cynthia: Yeah I saw that. Good to hear that you enjoyed FF--I wasn't huge on the place when I went. Betty: You're quite welcome. Looks like we've both experienced the same tranformation at Berkeley. I wish I'd started blogging back then! Matt: Agreed. You went to USC--so what brought you all the way up here for a meal? If your meat is clearly overdone, then certainly you wouldn't be out of line in sending it back. Fortunately, I can't remember an instance where such a thing has happened to me personally. I also tried the cafe and I couldn't justify the $95 price tag for the resto downstairs. A meal at E'toile in Wisconsin seemed better or maybe I was just put off from the couple that sat next to us breast feeding their kid at the table. You're right about L'Etoile though. Once again congratulations on a great post!!! I've become a fan of your posts. Actually I've had the opportunity of dinning in some great restaurants worldwide and started taking pictures and notes from them inspired from what you have done. Furthermore, I was watching the movie Julie & Julia last night (for the first time) and I was impressed by the success a blog can bring. U had been thingking about writing an email to you for quite a while. I don't want to bore your post column with details. I'll be contacting you soon. Again congratulations on a great post!!! P.S. You forgot to mention that Chez Panisse is a constant member of "The World's 50 Best Restaurants" List. 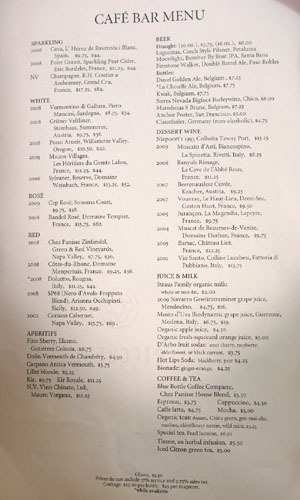 In fact in the new list published 2 day ago Chez Panisse came in 69. I do not mean to enlighten or anything; since I assume you already now this. Just commenting. Good to hear that I've "inspired" you. ;) Are you going to be starting a blog as well? I definitely saw the new Top 50 list. I was more surprised that ElBulli was knocked off the top spot! 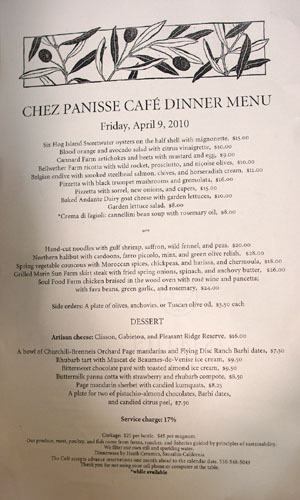 I am heading out to Chez Panisse tonight. I will let you know how it goes! I miss Berkeley so much after graduating!